Do you love great music? Music shouldn't be confined to one room in your house. How can you be expected to perform your Risky Business routine in the confines of a single room? Bluetooth Speakers cannot only accompany you in every room of your house but can also provide a soundtrack when on the go. 1. What are Bluetooth speakers for? 2. What do they cost? While many people will argue that there's no way to achieve top quality sound from wireless Bluetooth speakers. Considering advancements in wireless technology, each new generation of Bluetooth speaker so comes an increase in sound quality. We have compiled a list below of our favorite Bluetooth speakers. Wireless Bluetooth speakers are great for listening to music on the move. Whether you're in the backyard, miles away in the mountains, or sitting by the pool, these speakers allow you to keep the music going. These portable speakers are a little bit costly, varying in sound quality, durability, size, weight, and overall quality. If you're looking for a speaker you can tote around in your backpack, you may have to make concessions when it comes to sound quality. That's not true across the board, but in general, it is a sacrifice you will have to make. If you're having a large party or gathering, on the other hand, a larger Bluetooth speaker may be just what you're looking for. This can be one of the most important facets of a Bluetooth speaker. 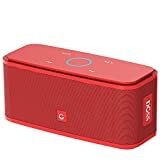 After all, if you're paying for portability, it is reasonable to expect that a Bluetooth speaker can maintain a quality sound for hours while being unplugged. However, if you're just planning on having a Bluetooth speaker plugged into a wall most of the time, this might not be a deal breaker for you if the price and sound quality meet your expectations. Durability is crucial. It doesn't matter if you can bring your speaker to the great outdoors if a little splash of water kills the party. There are several speakers that can range from providing rugged protection from drops to speakers that at least have some durability to scuffs, scrapes, and splashes. This is where you want the best bang for your buck. The end goal is sound quality, and the rest of the considerations are compromises that you (ideally) don't have to make. Sound quality can be measured by how high you can crank a speaker before it gets distorted, to overall sound quality and clarity. Below you'll find some of the best Bluetooth speakers on the market, designed for those who want great sound paired with either portability, durability, or long lasting battery life. Keep in mind, this list is not complete, but it will definitely help you narrow down the best Bluetooth speaker for your specific needs. RIVA's Turbo X delivers an unmatched musical experience from an audiophile Bluetooth® speaker that complements modern audio listeners lifestyles. By utilizing ADX Trillium Technology with premium audio components, you can immerse your movies and games experience with TURBO mode for 100dB of pulse-pounding rhythm. The internal rechargeable battery provides over 26 hours of playback as well as the ability to power your smartphone or tablet through the full-sized USB port. With 45 watts of power, speakerphone, and lightweight the Turbo X is raising the standard for premium wireless audio. Reminiscent of the lacquer-coated musical instruments it can reproduce with ease, Turbo X stuns in the gloss black finish with gunmetal silver accents. Turbo X is engineered from the world's premier audio components for use indoors or out. The speakers are protected by a soft touch aluminum mesh grill, includes dust and water seals, and LED illuminated touch-sensitive controls. Connect more to the Turbo X with a variety of inputs for your external wired audio sources including, Auxiliary 3.5 mm Input, USB Data Input, USB Charge Out 19V DC Power Adapter. Take full control of your Riva Turbo X wireless from your Apple or Android smartphone or tablet. Riva's Ground Control gives you the ability to change tracks adjust the volume with all the top plate touch sensitive controls displayed on your device screen. Incredible sound, portability, and price point. Meet the SoundLink Revolve+, the best-performing portable Bluetooth speaker from Bose. It delivers deep, jaw-dropping sound in every direction. Place it in the center of the room to give everyone the same experience, or set it near a wall and sound will radiate and reflect around the room, immersing you in that same feeling you felt at your favorite show. 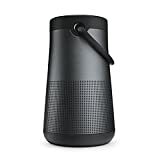 The tapered cylindrical shape with a flexible handle makes this wireless speaker easy to grab and go. Its durable aluminum body provides worry-free protection, and its water-resistant design lets you keep the party going, even if it starts to rain. The rechargeable, lithium-ion battery plays up to 16 hours—for full-day listening. Voice prompts talk you through wireless Bluetooth pairing, and you can easily take calls with the built-in speakerphone. You can even access Siri or Google Now right from your speaker. Pair two SoundLink Revolve speakers in Party Mode for more performance. Or put them in Stereo Mode: Instruments and vocals will naturally separate and spread across an immersive soundstage—making your music sound and feel as you know it should. The Bose Connect app also helps you manage your devices, unlock features and access future updates. You can easily charge the speaker via Micro-B USB port. And the auxiliary input allows you to connect to other audio sources. This mobile speaker is available in Triple Black or Lux Gray. Ultimate Ears BOOM 2 is the 360-degree wireless speaker that blasts loud, insanely great sound with deep, powerful bass in every direction–everywhere you go. It was designed to get wet, muddy, and beat up, so it's definitely portable. PartyUp allows you to connect wirelessly with up to 50 Ultimate Ears speakers and takes your party where no other sound system can go. Lakes, pools, or out in the woods, it's perfect for any environment. In addition to being portable, it's waterproof, shockproof, and crafted from premium material. With Siri + Google Now voice integration, you can use your voice to control your music — so instead of reaching for your phone, you can pick up BOOM 2, so nothing comes between you and the music. IPX7-rated waterproof (up to 30 minutes and a depth of 1 meter. The lightweight Beoplay P2 wireless Bluetooth speaker is a portable companion for your audio adventures. Featuring Bang & Olufsen Signature Sound, this mini Bluetooth speaker provides you with big immersive sound whenever and wherever you like. The P2 portable speaker packs rich sound character and superior bass definition into its small and stylish package. While the Beoplay A1 is designed for sharing, the P2 is a personal, fully portable wireless speaker that's ideal for listening to podcasts and amplifying your favorite music. The audio speaker is made of premium materials that are as attractive as they are tough. An anodized aluminum grill is paired with a strong polymer frame for a long-lasting and great-looking finish, and the rich leather strap makes for effortless transport. Durable enough for outdoor use, this rugged little speaker is ready to move. A built-in microphone keeps calls clear and allows for voice activation. The portable speaker also comes equipped with smart features which you can customize through the Beoplay App. When your speaker is lying flat, tap or shake it to access these smart features, which include playing and pausing music, skipping tracks, voice activation, and speakerphone, wake-up alarm with snooze and ToneTouch for matching sound profiles to activities. The P2 is always in standby mode, so there's no need to turn it on–activate it using your phone as a remote. The powerful battery delivers up to 10 hours of playtime on a single charge so you can keep your tunes, podcasts or calls going while you’re on the go. An included USB-C cable ensures you can always plug in if you outlive the battery before you recharge your speaker. Amplify anywhere with this premium Bluetooth speaker that puts the power of music in the palm of your hand, or in your pocket, so you’re always prepared for a high-quality, personal audio experience. JBL Flip 4 is the next generation in the Flip series; these portable Bluetooth speakers deliver surprisingly powerful stereo sound. This compact speaker is powered by a 3000mAh rechargeable Li-ion battery that offers 12 hours of continuous, high-quality audio playtime. Sporting durable, waterproof fabric materials available in 6 vibrant colors, Flip 4 is an all purpose, all weather companion that takes the party everywhere. 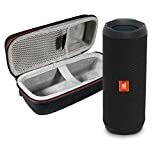 It also features a built-in noise and echo-canceling speakerphone for crystal clear conference calls, and JBL Connect+ technology that can wirelessly link with over 100 JBL Connect+ enabled Bluetooth speakers together to amplify the listening experience. With a simple button press, you can activate and talk to Siri or Google Now from your JBL Flip 4. It's portable, technologically advanced, and sounds great. The DOSS Touch Wireless v4.0 makes it easy to control the mood and energy of the party by allowing you fingertip control of the tracks you're playing, their volume and more. Enjoy a high definition stereo sound with an impressive volume whether you're lounging around the house, or partying, walking out, camping, hiking, biking. These Bluetooth speakers are equipped with advanced technology and compatible with all Bluetooth capacity devices. The Bluetooth speakers automatically reconnect to the last device used. Enjoy your music in 12W full-bodied stereo realized through dual high-performance drivers and a unique enhanced bass. A built-in Li-Ion 2200mAh rechargeable battery guarantees up to 12 hours playtime in 75% volume. Recharge in just 3-4 hours with included micro USB cable. Enjoy great sound and Alexa voice control in up to two rooms. 379 when sold together, or 398 separately. This is a great choice when you are deciding between different Bluetooth speakers. There is not much else that has been said about the Sonos One. It allows you to start and control your music with your voice with Amazon Alexa built right in. Play songs, check the news and traffic, control your smart home, and enjoy all those other Amazon Alexa conveniences using a single Sonos speaker. Ask Alexa to play music from Amazon Music, Spotify, Pandora, iHeartRadio, TuneIn, and SiriusXM. 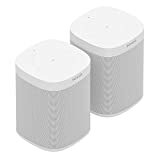 Listen to hundreds of other streaming services with the Sonos app while connecting wirelessly with other Sonos Home Sound System speakers to play music in every room of the house while enjoying a rich, room-filling sound from smart Bluetooth speakers. When it comes to overall quality, the Sonos One takes the cake! When choosing between different Bluetooth speakers, there are several things to consider. It is important to make sure you can find Bluetooth speakers that supports the audio platforms you use most, and that is offered at a fair price point. Start enjoying all of your favorite music on the move and in the great outdoors with your new amazing Bluetooth speakers!